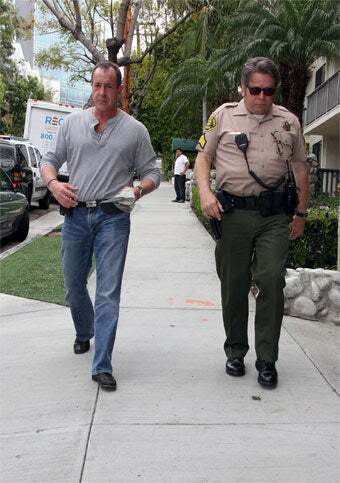 Michael Lohan showed up at Lindsay's home today—with sheriff's deputies—to check on the welfare of his other daughter, 16-year-old Ali, out of concern for her safety. Lindsay took to her Twitter account as it all went down. According to US, Michael presented a compelling case to the L.A. County Sheriff's Department about his safety concern for his minor child, claiming that the sisters had driven home from Coachella going 115 mph. The cops found no evidence of abuse, and allowed Ali to remain in Lindsay's home, but on the authorities' advice, Michael is reportedly going to the L.A. County Department of Children and Family Services, regarding Ali's exposure to Lindsay's lifestyle. Michael also said that he's meeting with Lindsay's lawyer today to discuss a conservatorship. Lindsay began Tweeting up a storm as the event was going down, airing her family's dirty laundry. Then she began responding to random followers/strangers/fans, discussing her predicament. Michael chimed in as well.